I’ve arrived fresh faced and green horned in the least populated region of Chile: Region XI, Aysen. I’m perhaps still getting used to the fact that the ranch at the very end of Lago Plomo, (a glacial lake ultimately fed by the meltwater of the Northern Patagonian Icefield) will be ‘home’ for the next six months. A variety of factors drew me here, if the opportunity to live and work in Patagonia for half a year is not reason enough in itself. I graduated in June, having studied geography for three years at Cambridge University. Apart from the mystique and imaginaries the name precipitates, Patagonia seemed to be the place where I could experience in the field most of what I learned and loved whilst studying. 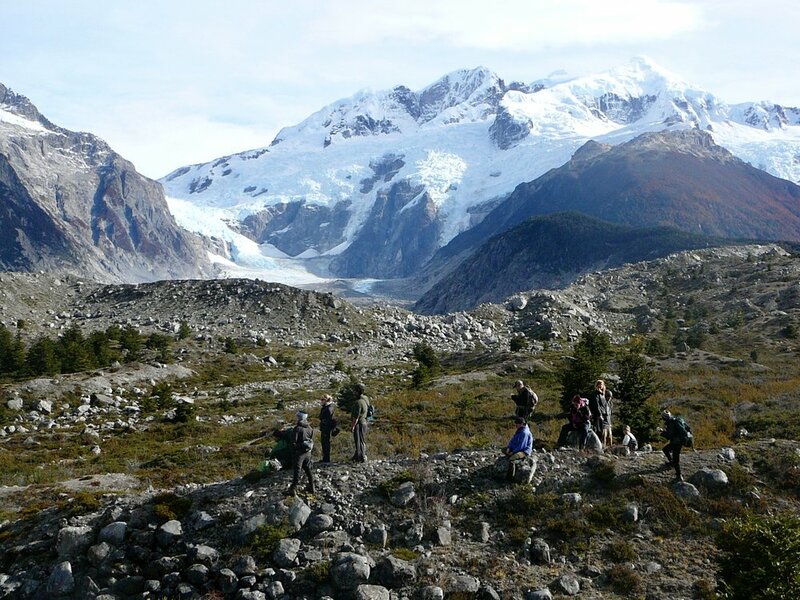 One can read the Holocene climatic variations in the sediments of Lago Plomo, patches of old growth forest still exist, harbouring incredible biodiversity, and glaciers coming off the icefield provide the perfect opportunity to study how ice masses may respond to changing climates. But why do I feel compelled to travel, to see, experience and learn in my boots, out in the field, when I could well have continued ‘armchair travelling’ immersed in the books and papers of a Master’s degree? The answer is that fieldwork is intrinsic to geography, and that ‘the principle training of geographers should come, whenever possible, by doing fieldwork’. Thus, my lived experience of the very topics I’ve studied heightens my appreciation and critical appraisal of them. I am lucky that Patagonia Frontiers places such high value on the practise of fieldwork, as this has led to an exciting project that will thread through my time in Patagonia. I’m diving into the challenge of developing academic based, geography-in-the-outdoors curricula for high school student groups that come to the area for reasons very similar to mine: because they share the conviction that learning by fieldwork can and should be ubiquitous to one’s education. The possibilities at the moment seem limitless: biodiversity, atmospheric science, conservation controversies and climate change past and future…thus the project can appear daunting, but I’m chipping away at an action plan. I’m lucky to have John as a soundboard, an educator for 35 years possessing vast experiential knowledge of the region. I’m really looking forward to the discussions with him, and the other members of the team, over yerba mate, by the fire, and of course, in the field.